Details Printers Charles & Ltd. began printing film posters around 1954 working largely with Rank and Universal. This is an early CinemaScope poster from the pen of the man who wrote "All Quiet on the Western Front". 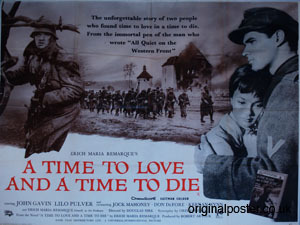 This Cinema poster features an advertisement for the Arrow Books novel for three shillings and six-pence and sports an interesting tagline: The unforgettable story of two people who found time to love in a time to die."